When you have installed Solution Manager 7.2 and need to patch the system, there’s a small hack how to calculate the patch without having to configure LMDB first. First, you need to configure SLD – just call http://<server name>:5<instance>00/sld -> Administration and execute initial setup. After that, you just have to send SLD data – in ABAP, call RZ70 and choose execute. In J2EE, call NWA and create the needed HTTP connections (SLD_Client and SLD_DataSupplier), then start SLD Data Supplier. When done, you can export the systems in SLD -> Administration -> Export -> Incremental Export -> All CIM instances. You can import the file into any Solution Manager SLD, create LMDB systems and calculate the patch. If your systems don’t have a license yet or your Solution Manager doesn’t have a installation number connected to SMP, just edit the installation number and enter any installation number (for ABAP, you have to edit it in SLD). Please note that you have to exchange the Installation number in stack.xml, if you have manipulated it in SLD/LMDB. You can enter INITIAL if you haven’t installed a license yet. As I Know, for the SAP Solution Manager 7.2 You can have the Patch XML from Maintenance Planner without doing anything else. It doesn’t ask your previous patch level even. The problem we had is that we couldn’t send the system data to Maintenance Planner – is there a workaround? You can plan a new system in Maintenance Planner. 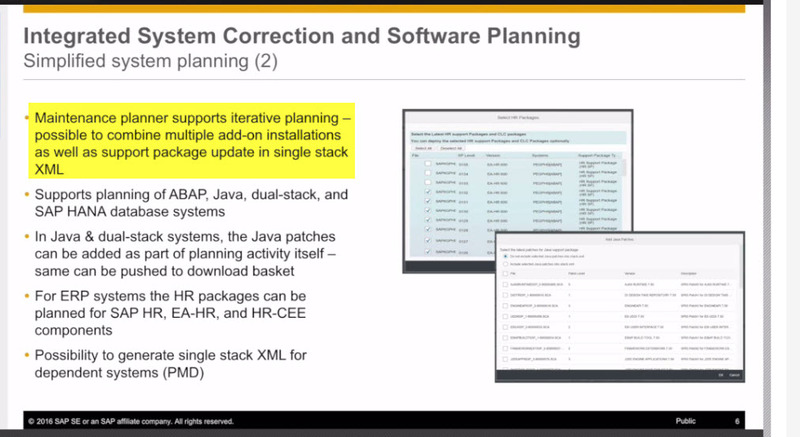 That’s a way you can get a stack XML that already includes the latest patch level without having to have the system registered into a SAP Solution Manager system first. So yes, this should be possible. Is it possible to upload the system data into maintenance planner directly without using LMDB?.. I tried to upload the system data from Development solution manager . it said upload is not possible from non-prod solution manager. I would appreciate any work arounds. The new Maintenance Planner allows you to create your system and select your target SPS. IN your downloads, you get all the package SWPM and also all the SPS and SUM..one stop shop so it avoids the entire SLD process. Suggest to the basis team to log into https://open.sap.com/dashboard and take the course Upgrade of Systems based on SAP Netweaver Advanced topics. After Fresh installation of the target stack. Before finishing you can download stack XML file required in SUM. Access the planner from this link. S-user authorizations may disturb your start but can be fixed with your admin user.